With higher education as it is, and as expensive as it is, postgraduate study is not something to undertake lightly. I wouldn’t be doing it if I wasn’t sure that I needed it, as much as I love learning and developing my skillset, it’s not something I would have chosen as an easy route! But it has meant I’ve been able to hang around at Hallam for another year like a bad smell. If you’re thinking of coming to or staying at Hallam for a postgrad qualification, check this out. If you have a specific career path in mind, for example you want to be a lawyer or a doctor, you’ll need to do a Masters in that area to reach that goal. For me I want to be in Higher Education so, I wanted and needed to do a Masters to get there! Another reason is because you want to follow a slightly different path and develop skills in a new area, or focus on a more niche area to what you have previously studied. For example, perhaps you’ve done a degree in History or English but whilst at University you’ve become really involved with the student newspaper and want to explore journalism as a career path. You’ve had experience working with the student newspaper, but you need to hone your skills more and gain a qualification before you can work in that area. Studying for a masters is really flexible, you can make it so you’re only in classes for a few hours a week. It’s perfect for fitting around a full-time career. Even if you’re without an undergraduate degree, if you have the skills and experience in the field and want to complete a master’s qualification in that area, Hallam might accept you onto the course after a short interview. Not only is it a great career booster in terms of building on your current skills and qualifications, you can also use a masters to change career – not just right after you finish university, but whenever. Don’t forget that if it’s something in line with your career and current job role, your company might cover the costs of your course and will be flexible in terms of you changing your working hours. It has to be said that to do a Masters in something, you need to be really interested in the subject matter. It is a commitment and there is a noticeable difference between undergraduate study and postgraduate study. So, it really helps when you’re doing your own research projects and assignments if you’re really passionate about the subject matter. For me, that’s the best part of doing a Masters, you get to continue to develop and explore skills and research, within an area you’re passionate about and you’re supported by the best people whilst you’re doing it. If you’ve been here before – maybe you studied as an undergrad here like me, you’ll already know you’re way around, know some people in the city and at the university and hopefully, just love being here. 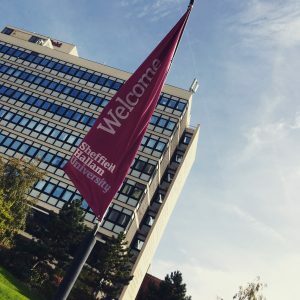 If you haven’t been to Hallam before, even better, you get to spend a year getting stuck in to exploring and enjoy everything Hallam and Sheffield have to offer! Also worth mentioning, for recent Hallam graduates, there’s a scholarship on offer! For 2018/19, if you’ve studied a degree at Hallam, you could get a £1000 scholarship towards your course fees!